Ok so my friend Kris (original course designer) and I are in the process of expanding Somerset DGC We have added long pads to all but 2 of the 10 holes we have (I need to get the distances to update) and have also put in 5 alt pin placements. We have a large section of land to add 9 more holes. The plan is to pull hole 10 so that basket can be a practice green and add 9 holes on the other side of the road (see map). I will update this thread as we move forward so people can see what we decide to do. can't see the map right now, but I love the idea. 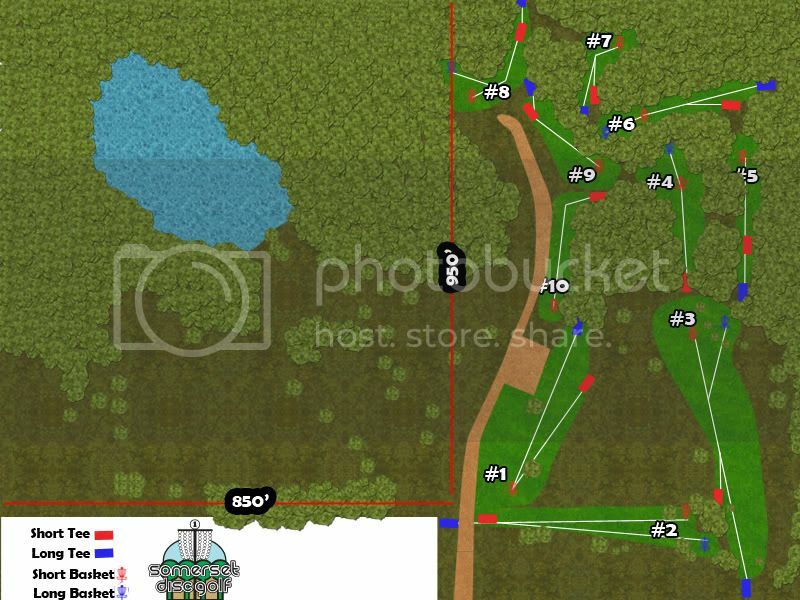 Although I actually liked hole 10 and would be sad to see that one go. Are you going to rough up the teepads a bit like we talked about earlier this summer so they aren't such a slip and slide hazard when damp? Yeah we are going to try some acid again and if that does not work we are going to use textured paint. I don't really want to get rid of 10 eather but we have a spot on the there side to make a hole like it. I aced 10 twice this year and I may be the only person who has aced it. It is just such a good spot for a putting green we have to do it. We will also be able to add a long pin to 9 if we pull 10 and I am looking forward to that. Let me know when you are coming, I would like to throw with you. Looks very cool. Just wondering about the walk from Long basket 4 to Long tee 5. It looks like you backtrack for the entire length of 4. 4 to the long pin is only a 250' shot. It is a bit of a flow flaw to go to the long pad for 5 but hole 5 is worth the walk. It is a tight slow hyzer that plays 325' and is vary hard to birdle. There real wasn't any other way to extend the hole. All in all the course flows really well. Kris the original designer didn't know the course would be so well received and there would be such a high demand for alternate pads and pins. The course was originally designed to intoduce new players to the game and it has been very successful. Smooth... That layout would be interesting. One problem is staring hole 10 were you did would not work because the long basket for 9 is going to go just past it in the woods by where pin 10 is now. I am glad for the input because it will help with our final design to get as many mock designs as possible. I need to find a way to illustrate the elevation because were you have the last few holes is a massive hill running the opposite direction you have it going. One hole we are for sure going to do will start in the bottom right corner of the illustration and go down to the clearing near the pond. It will be a massive 500' downhill bomb. Thanks for the input.